You have a limited time to make your 2019 Medicare choices. Get your FREE Information Kit today! As low as $0 monthly premium, $0 medical deductible, $0 primary care copay, $0 copay for 90 day supply of Tier 1 & 2 drugs at preferred pharmacies and by mail order. To get this FREE Information Kit, complete the form below. Or call 1-833-849-2023 (TTY 711). HMO Louisiana, Inc. offers Blue Advantage (HMO). Blue Cross and Blue Shield of Louisiana, incorporated as Louisiana Health Service & Indemnity Co., offers Blue Advantage (PPO). Both are independent licensees of the Blue Cross and Blue Shield Association. Blue Advantage from HMO Louisiana, Inc. is an HMO plan with a Medicare contract. 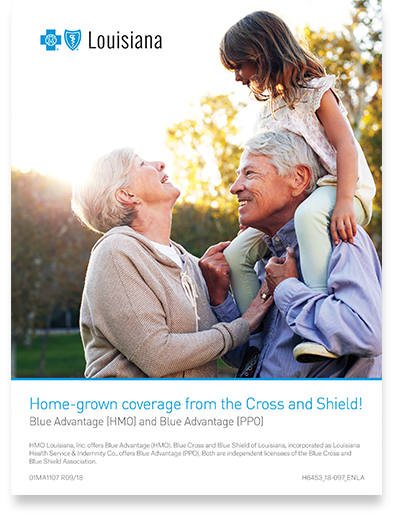 Blue Advantage from Blue Cross and Blue Shield of Louisiana is a PPO plan with a Medicare contract. Enrollment in either Blue Advantage plan depends on contract renewal. $0 Plans are now available in the following 39 Louisiana parishes: Acadia, Allen, Ascension, Assumption, Avoyelles, Beauregard, Calcasieu, Cameron, East Baton Rouge, East Feliciana, Evangeline, Grant, Iberia, Iberville, Jefferson, Jefferson Davis, Lafayette, Lafourche, Livingston, Orleans, Plaquemines, Pointe Coupee, Rapides, St. Bernard, St. Charles, St. Helena, St. James, St. John The Baptist, St. Landry, St. Martin, St. Mary, St. Tammany, Tangipahoa, Terrebonne, Vermilion, Vernon, Washington, West Baton Rouge, West Feliciana. $15 Plans are now available in the following 25 Louisiana parishes: Bienville, Bossier, Caddo, Caldwell, Catahoula, Claiborne, Concordia, DeSoto, East Carroll, Franklin, Jackson, LaSalle, Lincoln, Madison, Morehouse, Natchitoches, Ouachita, Red River, Richland, Sabine, Tensas, Union, Webster, West Carroll, Winn. $68 plans are also available statewide.